Nowadays many bureaucratical procedures can be done online. In just a couple of years, however, online will be the nearly only option in Chile. This paperless trend represents a challenge for older adults, as it pushes them to access the internet for everyday tasks that were simpler for them on paper, such as paying the bills or getting information on free activities for seniors. Older adults constitute a significant component of the Chilean population, as the aging process of this South American country has continued. According to the National Institute of Statistics (INE), the percentage of people aged over 65 years or more grew from 6,6% in 1992 to 11,4% in 2017 (2.003.256 people). If we extend the age range to 60 years or more, the figures get even more significant. According to the National Service for Older Adults (SENAMA), 16,2% of Chile’s population is 60 years old or older (roughly around 2.800.000 people) (‘Censo 2017 reveló que (…)’ 2017). The Chilean Senate has recently approved the bill of “Transformación Digital en el Estado” (“Digital Transformation in the State”). This law aims at modernizing the functioning of the State. “We are in 2018 and we still handle most of our bureaucratical procedures on paper”, said President Sebastian Piñera in the letter accompanying the law proposal (‘Mensaje de S.E. el Presidente de la República (…)’ 2018: 2). The president encourages the use of electronic resources based on two main arguments: saving time and sparing paper. One of the main points of the bill is that most State bureaucratical procedures will have to be done in electronic form. This bill takes into account the fact that some people lack access to the required technology, and it gives to those people the chance of doing bureaucratical procedures on paper. However, this possibility is strictly exceptional. While the electronic form is the rule, the paper is an exception that will have to be requested and duly justified (ibid. 7). So, how does this government initiative affect older adults? This 16% of the population needs to access the internet to become part of this ‘Digital Transformation.’ According to the Chilean Sub-secretary of Communications, 84,8% of the access to the internet in 2018 was done through mobile devices (93,4% of these devices were smartphones) (‘Conexiones 4G se disparan 35% en 2018 (…)’ 2019). This situation implies that older adults will need to master the smartphone to keep up with the proposed changes in the administration. Learning to use a smartphone implies a challenge for older adults, at least on two fronts. Firstly, it implies an adaptation to a new type of user interface (UI). Mobile devices’ UIs are radically different from the electromechanical UIs found in the older technologies more familiar to older adults. While in older technologies’ UIs most –if not all– of the system functionality is accessible at once through buttons and switches, mobile devices’ UIs imply navigating several screens and contextual menus that display only a fraction of the whole system at a time (Docampo et al. 2001). Secondly, this learning process requires proper guidance. In the smartphone workshops I volunteer, I often ask my students about the main obstacles they encounter in their learning experience. By far, the factor they complain the most about is that their younger family members lack the patience to teach them. “My daughter bought this phone for me –says a 63 years old lady– and taught me [how to use it] on the first day. After that, if I ask something, she says ‘I already taught you’!”. “When you ask them how to do something –explains a 67 years old man–, they do it very fast on your phone, ‘pa, pa, pa, it’s done!’, but they don’t show you how to do it”. Elderly students require self-paced learning, as they experience greater anxiety and frustration while learning to use new technology (Fisk et al. 2009). 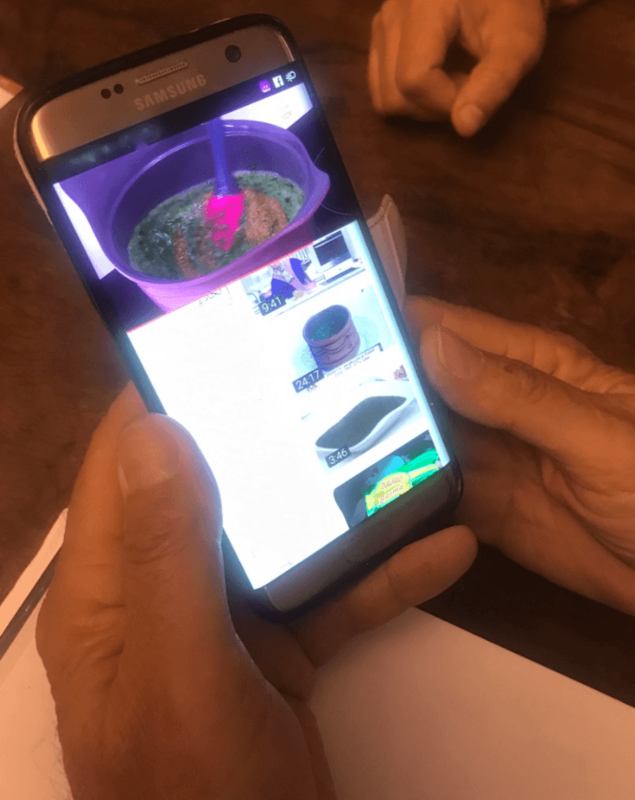 If the Chilean government wants to include this important sector of the population in this ‘Digital Transformation,’ then it should develop public policies to address the unique learning needs of older people properly. 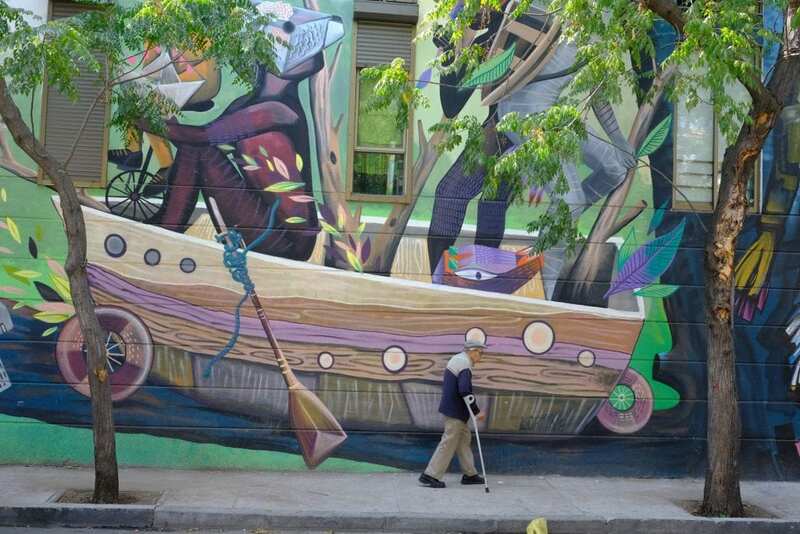 In all fairness, there are several state-run cultural centers and public libraries in Santiago that offer free lessons for older adults –as the ones where I’ve been teaching. They have two constraints, unfortunately. On the one hand, there is a very limited number of places: in some cases, students are allowed to attend a workshop only once, as they have to leave the place to new students. These workshops usually last one month (with one or two classes a week), which is not enough for students of this age, who need various exercises over more extended periods (Fisk et al. 2009). On the other hand, the teacher-to-student ratio is not as high as it should be. The diversity of UIs across the whole spectrum of Android phones requires personalized teaching, as any procedure explained in front of the entire class has to be repeated with each student, to apply minor –yet fundamental– tweaks to each case. 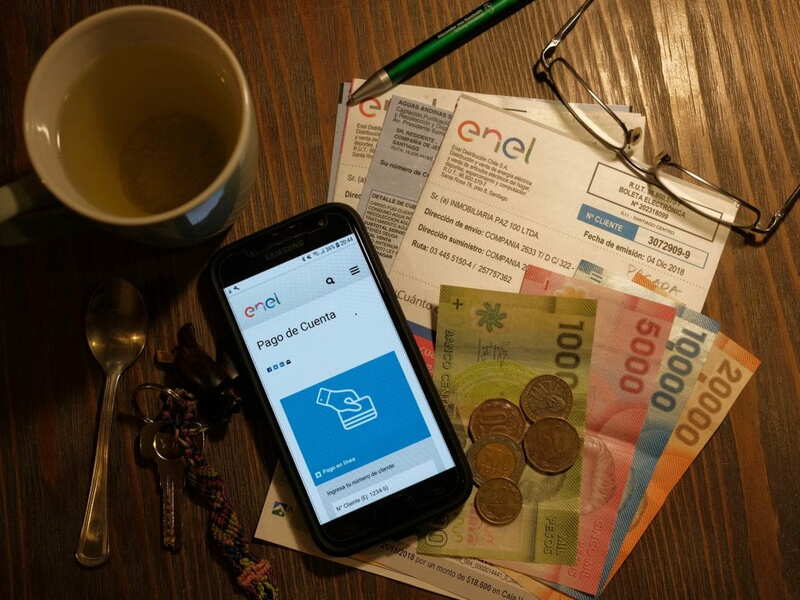 Chile is pushing forward the paperless trend. A well planned public policy of digital alphabetization for older adults with specialized teachers would be then of the utmost importance to help the older ‘digital immigrants’ (Leung et al. 2012) to join the trend. Docampo Rama, M., De Ridder, H., and B. Ouma , H. 2001. Technology generation and age in using layered user interfaces. Gerontechnol. 1, 1, 25–40. Fisk, A. D., Rogers, W. A., Charness, N., Czaja , S. J., and Sharit, J. 2009. Designing for Older Adults: Principles and Creative Human Factors Approaches2nd Ed. CRC Press. Institituto Nacional de Estadísticas Chile. 2018. Síntesis resultados Censo 2017. Santiago: Instituto Nacional de Estadísticas Junio / 2018. Leung, R., Tang, Ch., Haddad, Sh., McGrenere, J., Graf, P., and V. Ingriany. 2012. How Older Adults Learn to Use Mobile Devices: Survey and Field Investigations.ACM Transactions on Accessible Computing, Vol. 4, No. 3, Article 11. In Uganda, 70% of the workforce is employed in the ‘informal sector’ [UBOS, 2014], mostly self-employed in unregistered business. This is reflected in Godown, the Kampala fieldsite, where the majority of interviewees run their own small business, such as hawking fruits, market vending, driving bodas (motorbike taxis) and brewing waragi. Many of these jobs require physical labour. The deterioration of physical health, accelerated by physically demanding work, can mean that old age presents a significant challenge to people who rely on their bodies for their income. This is the case for Achola’s husband, who throughout our recent interview, was busy bending to serve food to frequent lunchtime customers. It turned out he had chronic back pain. A visit to the hospital the day before had confirmed that ‘his spine is splitting’, a slipped disk. He’s not responded to other treatments and can’t afford a brace, so they’ve recommended surgery, but he’s nervous to weaken himself; he needs to work for his wife and grandchildren, and elderly relatives in the village. He was even planning to take the 10 hour bus to visit them the following day, ‘I have to go and farm, it’s the month’. 65 year old Palma also has back problems after 30 years of ‘moving with bananas’, carrying a basket to sell in town. She has to continue working to support her 3 orphaned grandchildren. ‘It was her parents to take care of them and her’, but now she has to do it alone. 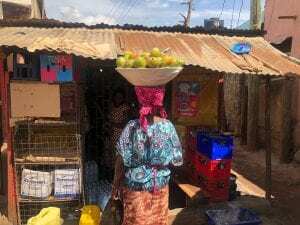 She struggles to pay their school fees, and in return, they cook, wash and clean for her. Sometimes she falls sick, and the family must rely on her neighbours to bring them food. 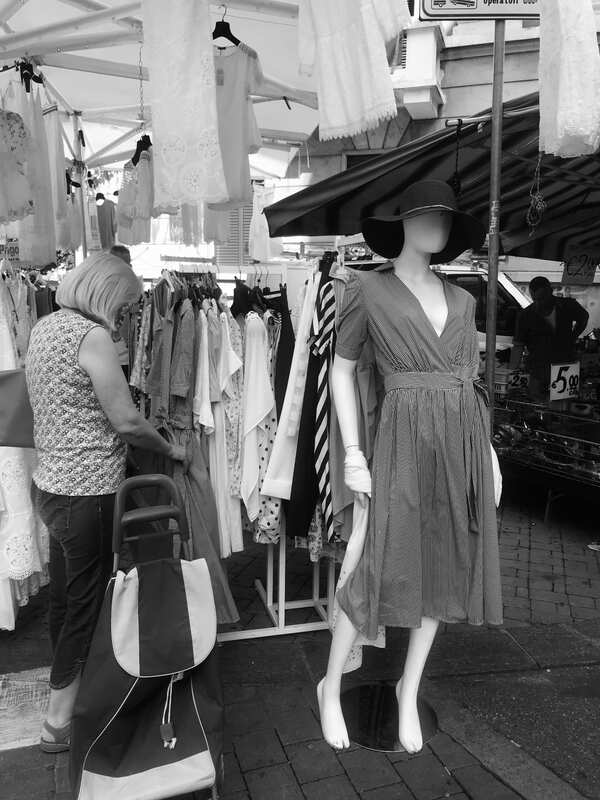 Whilst she feels that her work has kept her active and healthy, she’s now tired, so hopes she can get a market stall so she can sit in one place. Both stories here emphasise the reliance on family support in old age and the burden this places on individuals, especially when it breaks down. The head of physiotherapy at the local government hospital is all too familiar with such stories. He feels that informal workers contribute significantly to the Ugandan economy but are neglected by public services. He hopes for further investment in prevention and promotion to alleviate the impact of physical work on people’s bodies over time, seeking health protection for informal workers and advising them on how they can better protect themselves. As part of the ASSA project, we plan to make a short film on the impact of physical work on older people’s health in Godown, that he can use to support further research, advocacy and community sensitisation to this end. Kinship studies have been the bedrock of social anthropology for more than a century. But the main emphasis has been on issues of classification, the structuring of society, and the norms of relationships. Kinship will play a major role in our publications, but my hope is that the emphasis will be more on the experience of kinship. Grandparenting is a good example of this. Precisely because it comes late in life, grandparenting is so much more than simply the relationship to the grandchild. It is often a coming to terms with and sometimes a resolution of the entire experience of kinship up to that time. To understand why the people I study take a particular attitude or degree of involvement with grandparenting usually means understanding their past relationship to their own parents and to their children. For example, a man who feels he was neglected as part of a very large traditional family, and then in turn neglected the parenting of his own children, because he was in full time work, may see being a grandfather as his first opportunity to explore kinship as inter-generational love and care in depth. While a woman who had most of the burden of parenting and feels she discharged her responsibilities and has experienced that intensity of love and care, may be quite happy to keep her role as grandmother to a minimum, using this period to find the balance between personal autonomy and kinship obligations that has eluded her through a lifespan that up to now has fluctuated between too much kinship and too little kinship (such as the period of the empty nest). When this works well grandparenting is both joyful and profound because it is experienced as the final reconciliation of so many tensions within past kinship, now at last reaching a balance in which kinship becomes pure enjoyment. But the key to this is not so much the relationship one chooses to have with one’s grandchildren but the transformation this brings about in the relationship to one’s own children. 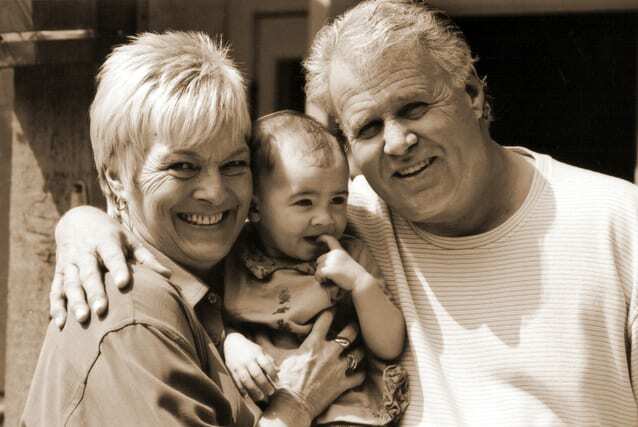 Because as a result of grandparenting, people often find that their own children, who for the period when they were teenagers or in their twenties, may have been barely in touch, are now, to at least a small degree, dependent again upon their parents. But often unlike the period when they were young, and most unlikely at the time they were teenagers, they may both acknowledge and appreciate that dependence and what their parents did for them. Welcoming their parents as the grandparents of their children demonstrates that they finally trust and respect the parenting that they themselves received. I have also been struck by how grandparents contrast this situation with the trauma and neglect they felt at being raised in traditional large families which seem to have resulted in many tensions with siblings and their own parents, and which now they are coming to terms with. Often things do not work out quite so smoothly, a daughter wants her mother to mind both her grandchildren so she can go back to work. But the grandmother refuses because she wants to remain their grandmother not an ersatz mother. A child with very bad memories of being parented may want to keep the grandparent away from their own children. Grandparents feel they have been replaced by smartphone screens as their grandchildren are present in their carem but not interested in the stories and toys that the grandparents have been aching to share one more time. On balance though, at least for the people in Cuan I have been studying, grandparenting often appears to be this profound coming to terms with the entire history of kinship experienced up to that time. My point is that studying grandparenting in depth has helped me towards an alternative anthropology of kinship itself, one that is perhaps more holistic and based on kinship as cumulative experience, a rather different perspective to the traditions of kinship studies I was taught as a student. Three months ago, the world celebrated International Senior Citizen’s Day. On that day, the Central Bureau of Statistics of Israel published data showing that, for the first time, at the end of 2017, the population of senior citizens (65+ years old) in Israel passed one million people : 566,000 women and 452,000 men. 42% of the senior citizens are above 75 years old. In addition, 87.2% were Jewish senior citizens (65+) whereas 74.5% were Arab senior citizens. Of these 12% of the Arab senior citizens and 31% of the Jewish senior citizens live on their own. A key problem for this age can be poverty. In Israel, the basic monthly pension monthly of around 2,000 shekels is very low, considering the high cost of living in Israel. 25% of Israeli senior citizens are considered poor. On November 28th the Israeli Parliament narrowly failed to pass a law to double this to equal the minimum monthly wage of 4000 shekels. The population of my field site of Dar al-Hawa in Jerusalem, have specific problems. Although they rarely live alone, Israel is an expensive place to live as the monthly expenses of gas, electricity, housing and food, medications are high. But to apply for an increase in welfare stipends means encountering a complex bureaucracy, which then becomes a major part of one’s life, especially when digitization has made it even more inaccessible. In the past few months, I found these issues has come to define my role as a participant observer ethnographer. My job has been to translate language and help with the issue of digitalization. 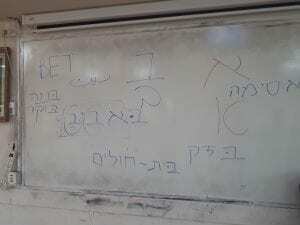 People need help in reading, writing and sending letters to all kinds of official authorities – among them The National Insurance Institute of Israel (Bituach Leumi). The key problem is that although Arabic is the second ‘official’ language in Israel, many official websites and forms (both offline and online) do not exist in Arabic at all, or they exist in part. There may be some explanation in Arabic, but you still have to fill the form in Hebrew. In a survey among Arab senior citizens only 53% estimate that they speak “very good”, Hebrew 49% but 15% do not know how to read or write in Hebrew. Therefore, part of “participating observation” is teaching my Informants Hebrew. 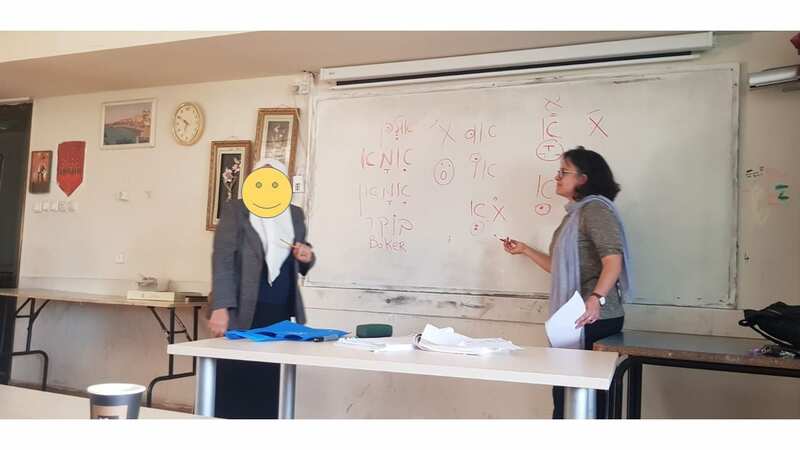 Knowledge of Hebrew is particularly poor among those who have lived on the Jordanian side of the pre-1967 border, and for women who are less likely to have worked within Israel. Hadeel (71) lived on the Israeli side of Dar al-Hawa and holds Israeli citizenship, and Samah (73) lived on the Jordanian side of Dar al-Hawa until 1967 and holds permanent residency status, but both asked for my assistance with Israeli bureaucracy. Hadeel and Samah are good friends. 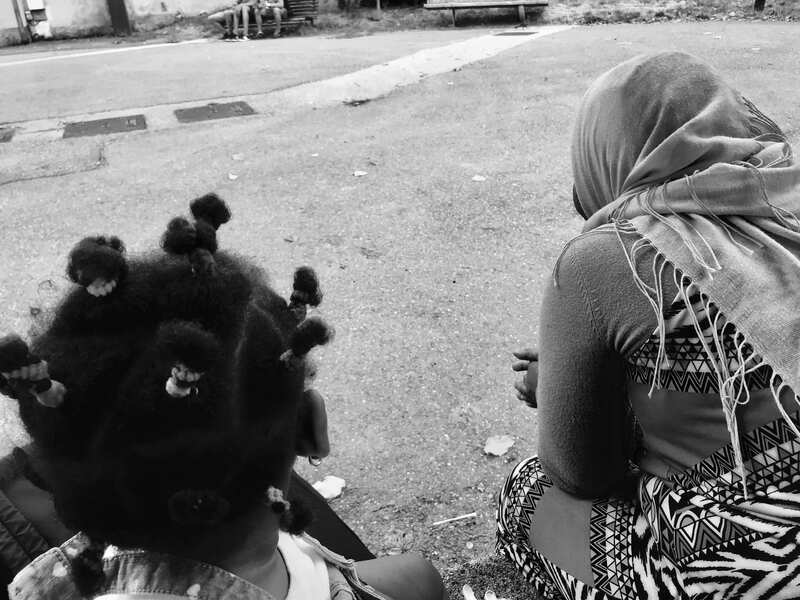 On my first visit at Hadeel’s home, she asked me to call to The National Insurance Institute of Israel, asking them to add money to her monthly stipend. We called them together and were informed that Hadeel needs to submit her request online. Since Hadeel has neither smartphone, computer or internet, we used my smartphone to apply online. After we applied, Hadeel received, “for the first time” she told me, an official letter from the National Social Services, written in Hebrew, outlining her entitlement to home assistance, but this must be renewed after three months. Samah’s is a widow for more than 10 years. 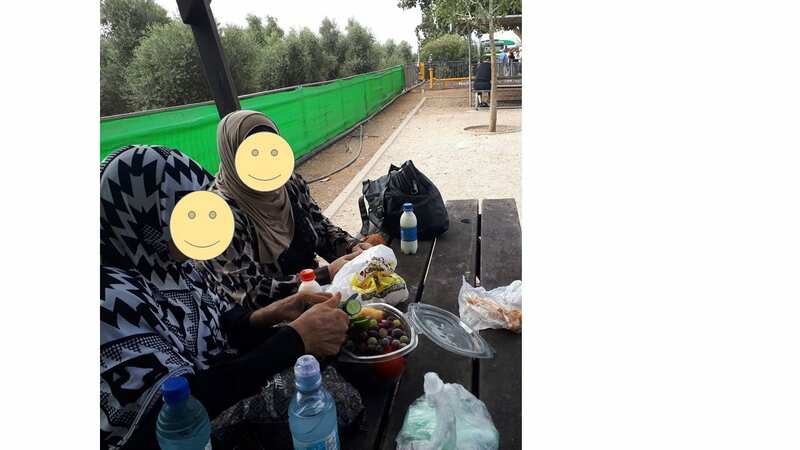 All her life she paid her taxes, but recently she received a letter in Hebrew from the National Social Services saying they suspect that she is no longer living within Israeli territory. Samah brought me this letter and asked me to translate it. When reading it, I realized how severe this problem could be, since if she failed to convince the authorities that she resides in Israel, she will lose both her monthly stipend and access to health-care services. Samah has had to turn to a lawyer for advice and support. For these citizens there are three interconnected problems that dominate my fieldwork. 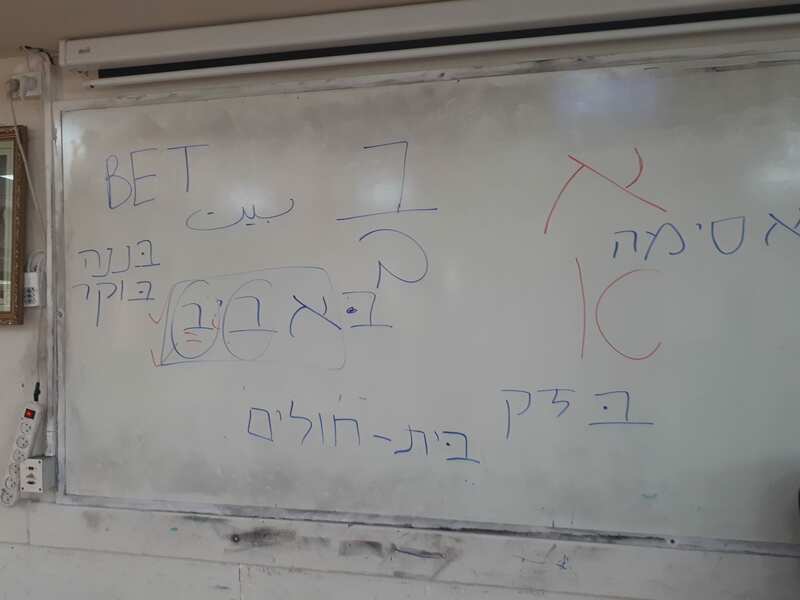 Their lack of Hebrew, their lack of knowledge about digital communication, and above all their constant fear that they will lose their rights. All of these reveal the basic inequalities of living within this field site of Dar al-Hawa. It is 4pm on a Thursday afternoon, rush hour for taxi drivers in Yaounde, capital of Cameroon. Along a busy central street of the city, a loudspeaker perched on the roof of a pickup announces the opening of a “new fitness club”. His slogan, “Zumba keep fit in joy!” The Zumba club is advertised in a large city hotel in the heart of the administrative and commercial district. Another day, another setting, at a junction near a popular downtown area is another professional announcer, this time aboard a mini van with speakers on the hood, informing pedestrians of the opening of the « sports club- the Kun dojo ». The leaflet distributed by one of the advertisers emphasizes that there are other activities also: “Zen Arts”, “Massages Kun”, gymnastics, all in an “air-conditioned” space where there is also a “health snack” “. These two scenes have become commonplace in the city of Yaoundé. In almost the entire city and regardless of the socio-economic environment (upscale, medium, poor), there are fitness clubs, or just “sports clubs” with varying levels of equipment, but with always with the same ambition of bringing fitness to people of every condition – with only condition: the ability to pay for fitness. In past years, Ludo-sports practices in Yaoundé were marked by two major characteristics. On the one hand, their popular, participative and socializing dimension, on the other hand, their outdoor exercise. At the turn of the 2000s there was, in order of popularity, football in groups still called “two-zero”; basket ball named “candy”, a “sports walk” also practiced in groups and a race. If this logic is more or less the same, we are witnessing the rise of sports-leisure in the gym club and especially fitness. Initially called “gym club” and located in only upscale neighborhoods or in the center city near some luxury hotels, “gym” has now mutated into fitness clubs. What is the difference between these two?When you go to the gym in Yaounde, the rooms are large spaces where machines are arranged to support activities. In the fitness club, spaces are more liberated. There are fewer machines or almost none at all. In clubs where zumba is practiced, the machines are practically non-existent. Another change, while coaches for sports clubs and gyms used to be male, today we are witnessing a feminization of this coaching scene, as we can see on the Zumba club announcement poster with coach Yolande. This feminization marks a trend that emphasizes local ownership of fashionable practices at the global level. In the Bastos district, one of the city’s most exclusive places to live, yoga clubs that did not exist until very recently have been created and are open to a mixed clientele. In addition to expatriates living in this cosmopolitan area, people from the middle class in Yaounde also attend. Another trend, Asian massages are more and more evident. These are both related to the global circulation of fitness and its variations such as Zumba, but also the ever-increasing presence of Chinese people, Indo-Pakistani or Indian. From this point of view, sport-fitness and massage or Zen sport practices constitute a paradigm of the globalization of sport. As in Western countries, these practices reflect a bourgeois ethos which is expressed by the fact that these practices are found first in exclusive areas before migrating gradually to the less affluent areas. The cost to join varies from 20 000XAF (30 euros) to 40 000XAF (60 euros) per week according to the place and district where it is situated. A Zumba club situated in an international well-known hotel will not have the same cost as that situated in a lower income area. The interviews we had in Yaoundé show that motivations to join a club vary from leisure, pleasure to networking. Some informants -mostly women -in those fitness clubs come to « keep fit » while others come to have fun and pleasure. Most of the informants say that maintaining health is the primary source of motivation. People say they “have to move”their bodies. This expression is itself related to the presence of French and Western media. The slogan “eat-move” often publicised by some French media strongly resonates. The motivation linked to the idea of ​​”moving” comes from the public health discourse largely taken up by members of fitness groups. The link between sport and health is once again part of a globalization of sport practices. Strongly promoted by the World Health Organization, relayed by public media and very present on the internet and now on WhatsApp and other blogs followed by thousands of people, sport for health is constantly reiterated in the global circulation of practices and speeches. Ludo-sporting practices also have sociological and strategic motivations such as affiliation needs. Contrary to what might appear these personal activities that do not necessarily involve a team are also capitalized on by some people to create a network of social ties in specific areas. It is obvious that one does not meet the same people in Mvog-Ada a deprived district than in Bastos the district of expatriates, diplomatic representations and international NGOs. 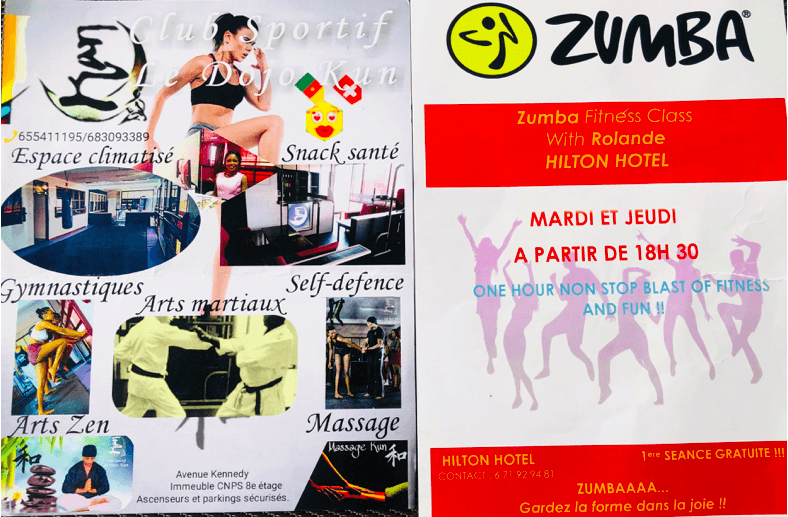 The audiences participating in the yoga sessions at the Hilton hotel a central location are not the same as at the sports clubs of the University of Yaounde. The new Ludo-sports practices are thus like other sporting activities: the places of regulation of the social experiments and quests of oneself in the double meaning of personal sports itinerary and of need of affirmation within specious social classes. Zumba and fitness also play a social performative role in certain circumstances. Practicing Zumba is adhering to the latest practice that is fashionable at the global level. A 42-year-old informant working in a bank in Yaounde said she liked trying out the latest trends in sports. As many Yaoundéens practitioners try to be open to new things and participate in the world. 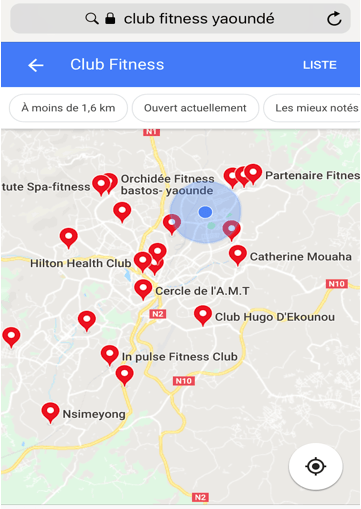 A quick search by the search engine Google allows us to see the locations of some gym clubs in Yaoundé. This deserves some comment. Firstly regarding their density. Those who appear on the search are not the only ones. Then, far from being a phenomenon of higher class and upscale neighborhoods, we see draw a map covering the entire city. This presence on the internet is accompanied by a very strong publicization of some of these clubs. Most of them hold facebook pages on which are regularly posted numerous videos and photographs of participants in the activities. The idea is then to stage a crowd of fitness fans and other activities offered in the clubs. In all cases, the publicity measures taken by the fitness club highlights the strength of the circulation of Ludo-sporting practices and their appropriation at the local level. 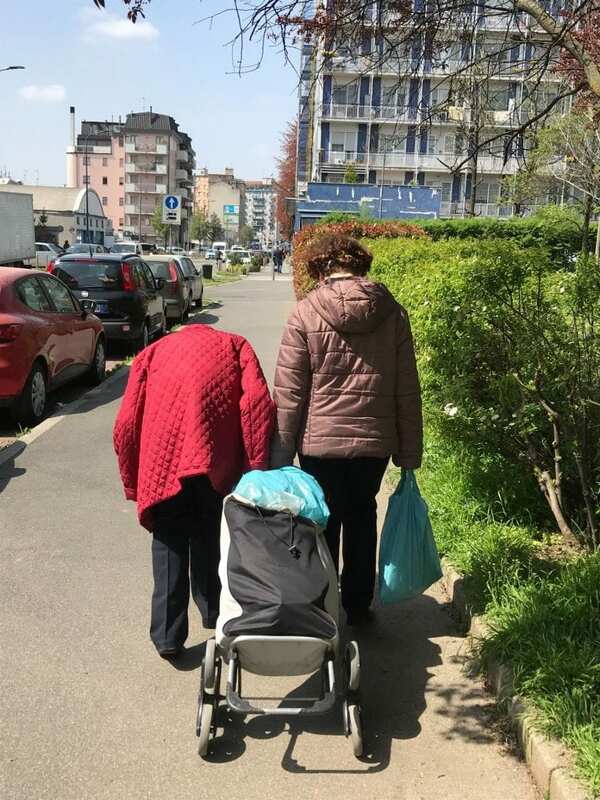 Among the themes that have emerged from my research on ageing in Milan over the last 14 months, relationships between women and their Mothers have been particularly prominent. 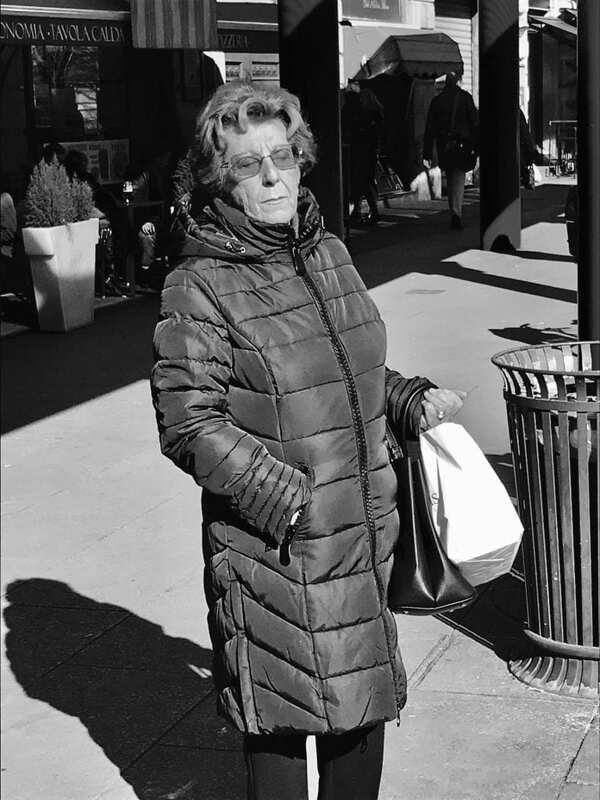 I have been exploring the significance of physical proximity, distance, and smartphones in examining how care is enacted in these relationships, amongst women of different ages and backgrounds. The following examples illustrate some aspects of this work. Elena (55) and her 80-year old Mother, Maria, are both from a nearby northern Italian city where Maria lives alone following the death of her husband, Elena’s Father, three years ago. Elena, who is married, without children, lives and works full-time in Milan. 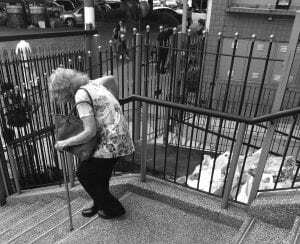 Maria has a range of physical mobility issues, meaning that she is largely house-bound. She refuses to accept help from care workers (known as Badanti, in Italian, who are often from other countries), for the encroachment she says she feels this would pose to her autonomy. Maria does not appear to trust Badanti and dislikes the idea of ‘strangers’ inhabiting her home space so intimately: “These carers are caring for the money after all, are they not?” She explains. “For them it’s a job. They don’t really care”. The ‘real caring’, following Maria’s definitions, is carried out by her daughter Elena, who, not having any siblings, bears full responsibility for her Mother’s care. Maria does not have a smartphone, so Elena calls the house phone up to three times a day from Milan to check in. At the weekend, Elena drives the two-hour round trip to provide weekly shopping and carry out basic household chores. The two women share in each other’s company, and Elena will often stay overnight on the Saturday. Elena herself, back in Milan, faces a range of problems of her own, including pending unemployment, and a marriage under strain. Photo (CC BY) Shireen Walton, Milan fieldwork. Elena’s situation is not uncommon in Italy, and elsewhere. Studies have highlighted the anxiety, depression, and emotional strain often experienced amongst children, particularly daughters, who are primary carers for elderly parents (Amirkhanyan AA, Wolf DA. 2006). These pressures characterise, for instance, what has become known as the ‘Sandwich Generation’ (Chisholm 1999; Riley and Brown 2005) of presently middle-aged women caring ‘upwards’ to parents and ‘downwards’ to younger children. 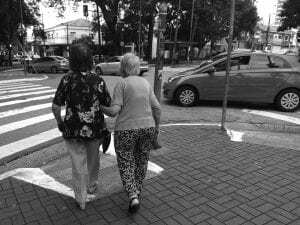 From Maria and Elena’s nigh-on co-dependent relationship, one sees how what makes ageing so complex and intense a social experience is how the physical conditions of ageing bring about the modulating of roles, without altogether subverting or eradicating existing ones. ‘At a certain point” Elena explains, “you swap – daughters become Mothers and vice versa.” The relationship in reality is not as clear-cut or one-directional as Elena’s swapping over analogy implies. Instead, the layering of the Mother-daughter relationships thickens, and intensifies as the denial of change sets in. Maria appears to be very much still “the Mamma” in charge of the family home, whilst Elena effectively ‘project manages’ her Mother’s care. Never actively acknowledged between the two women is how ageing has modulated their relationship. Where international migration is involved, daughter-Mother relationships play out in different ways. Kemala is from a small village in North-East Indonesia. She came to Italy ten years ago to study and work. She now lives in Milan with her husband and two children. Despite the distance, Kemala feels deeply connected with her childhood upbringing in Indonesia, and particularly with her Mother, who at 75 still runs the rice-packing business she had established in the village forty years ago. Despite this, Kemala has always found the intense sociality of her natal village context stifling. The youngest of eight children, she felt, from an early age, a need to leave, by pursuing education and upwards social and transnational mobility. Kemala has returned to Indonesia with her young children, but is unable able to do this often. Kemala’s wariness towards “too much” hometown sociality is reflected in her WhatsApp usage. Strikingly aware of what constitutes her “equilibrio” (equilibrium), Kemala chooses when and how she participates on family WhatsApp groups. She responds on the transnational family group (consisting of over 30 people) only on important occasions such as select birthdays, or Eid. Knowing that this group exists however, and that “everyone is there”, she confesses, provides comfort to her being physically far. She speaks with her Mother one-two times a week via WhatsApp on her sister’s phone in the village, since her Mother does not have a smartphone. Kemala engages in care, but on a crafted, individual basis that she deems important for maintaining her sense of balance between countries and socio-cultural groups. She explains how “the distance helps. 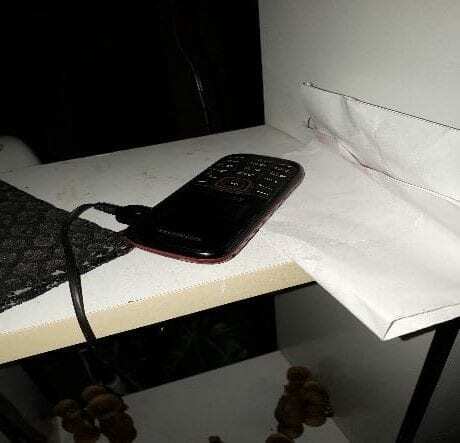 It creates a kind of a safety barrier, and behind this barrier, I quietly live my life.” Kemala’s use of smartphones recalls in part Ahlin’s (2018) notion of ‘frequent calling’ in the ethnographic context of transnational Indian families, whereby regularly keeping in touch constitutes notions of ‘good care at a distance’. The frequency of calling with Kemala, however, is modulated by her notion of self-care. For Kemala, (self-)care is constituted through distance, or rather the smartphone’s socio-technological capacity for facilitating ‘distant-closeness’ (Van House 2007). Meanwhile, the pervasive guilt that Kemala feels about honouring her individual commitment to social distance, and in being physically away from her village and ageing relatives, shows up in her everyday life in Milan. Over the months of participating in community activities together, I notice how she breaks into tears at what appear to be the slightest things that link her to Indonesia, to her village culture, but especially to her Mother. Photo (CC BY) Shireen Walton. Milan fieldwork. As Kemala continues to crafts her life in the present, this is done at the intersection of her emotional proximity but physical distance to her kin and village, and her determination to facilitate the best life she can as a Mother herself to children born and growing up in Italy. Elena, Kemala and their relationships with their Mothers reveal how individuals navigate their wellbeing in complex ways on– and offline via a range of practices rooted in kin relations, social-cultural contexts, and normative expectations. The smartphone, highly present for some, less so for others, facilitates a capacity for virtual presence, distant-closeness and ‘care at a distance’, while physical distance for some enables self-care in the pursuit of individual wellbeing. This is particularly significant in cases of co/dependent Mother-daughter relationships, and contexts of intense family and/or cultural sociality. Van House, N. A. (2007). Flickr and Public Image-Sharing: Distant Closeness and Photo Exhibition. CHI’07 extended abstracts on human factors in computing systems, New York, ACM Press. This month I have been asking people about retirement. I’m finding that some people adopt grand projects on their retirement: one man, for instance, published a book that compiled all his photographic works completed over 12 months in the 1950s. A woman told me that she has collected all the short stories and opinion pieces she ever wrote and put them in a folder for relatives to read after she is gone. Finally, one man who does not see himself as particularly artistic or creative, keeps a photographic record of his holidays to leave to his adult children in years to come. As we talk about such matters, the word legacy comes to mind. But legacy is difficult to capture because for many – including myself – it is unclear precisely what this term means. For some it concerns completing something that has worth and would otherwise remain undone. For others, it means leaving a sort of cartography of memories behind for the next generation. Legacy, I have realised, tends to suggest individualised works and occasionally my assumptions have been challenged in this regard. 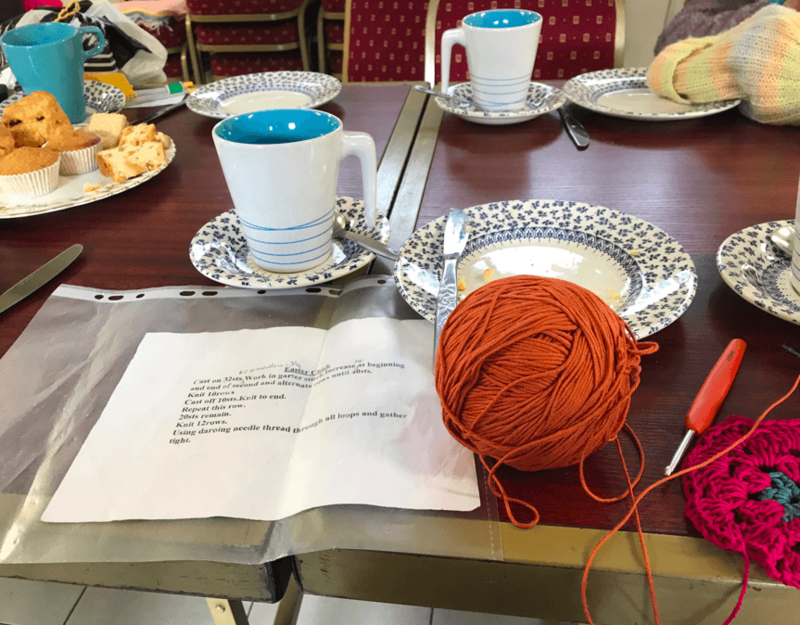 This month, a group of retired, elderly women I meet regularly embarked on a craft project to knit several hundred small chicken shapes in preparation for Easter. The chicken shapes will be given eyes and ribbons around their necks. They will be stuffed and decorated. The local chocolate factory have agreed to donate several hundred small chocolate eggs that will be inserted into the chickens and then the totality will be given to the local hospice as part of their fundraising activities. 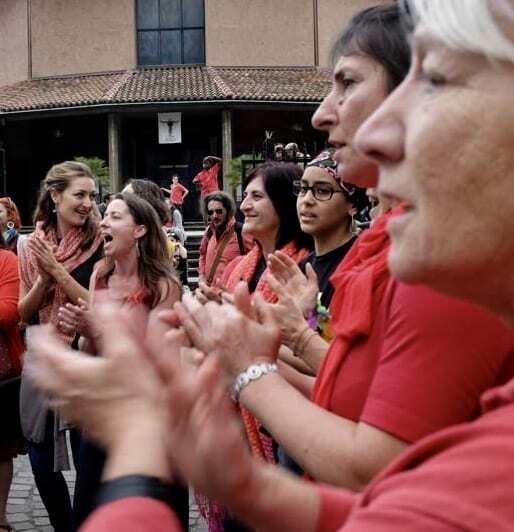 As I’m told of these tasks, I marvel at the work, the energy, the organisation and the generosity of these women and wonder if activities such as these represent a collective legacy, something bigger than the sum of its parts. But at the same time, I think there is more to these activities than issues of legacy. Keeping busy is a common motif in my research. One man described his wife as ‘she’s like a shark, they die if they stop moving’ whereas another referred to the bonus of ‘having something to get me out of bed in the morning’. Anthropologists are aware that it is in the structured routines of the day, that time is felt and experienced. As my research progresses I find that respondents constantly talk of practices in terms of time, ie. finding something that gives shape to the day, that takes time and converts it into something productive. Time, for some becomes problematic not because it is scarce but because it must be filled. Commonly women in my craft group, aged in their 70s and 80s comment on their need to stay busy. One woman told me she had knitted 100 small chickens because ‘I just knit when I’m watching tv’. Another joined in that she also likes to have something to do when watching television, ‘I feel guilty if I’m not keeping active’, she said. Of course watching television is not ‘doing nothing’, but the emphasis is on being productive with time, not letting is slip away. This point is considered so self evident that some informants look at me askance when I ask why it is a good thing to be active. Activities fulfil the purpose of keeping them busy, of filling time that otherwise might be empty where they might feel adrift. In that respect, time is something that is ideally practiced. Which leads me to wonder: which is most important – the doing of time or the activity that fills it? 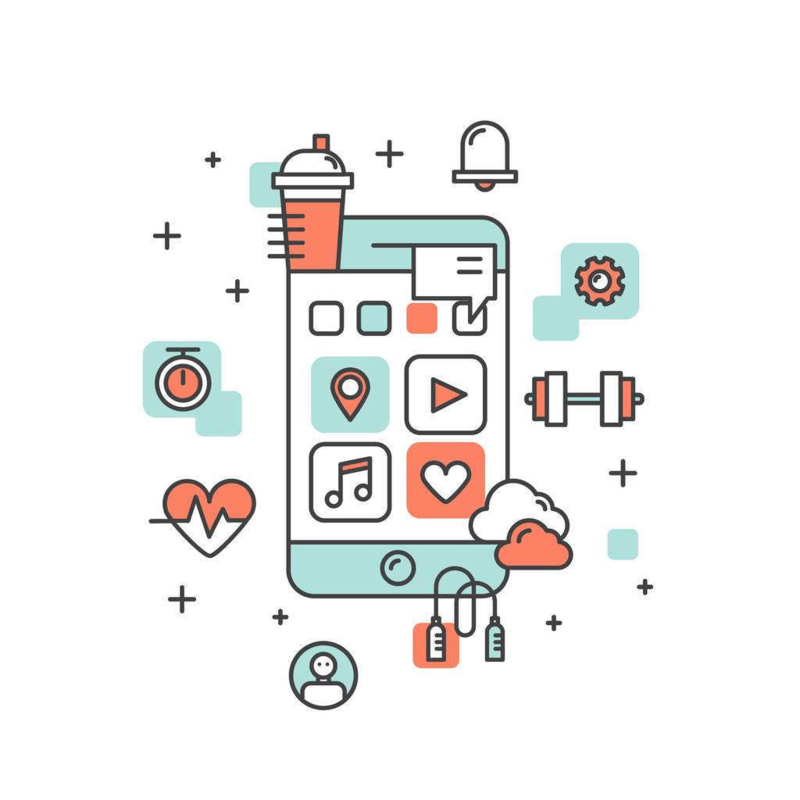 A major aim of our project is to provide new insights and approaches to the question what is a smartphone, see my own contribution to The Conversation, the key to this is understand it as a collection of apps. The academic community has been relatively slow to address the nature of apps, despite their evident importance. A recent book called Appified (Morris and Murray 2018) tackles the question head on with thirty chapters each dedicated to a different App. I want to briefly review here what I found to be the most important contribution of this volume. Most of the chapters are directed to whatever the author thinks is the most interesting or intriguing quality of the topic which the App addresses, what it tells us about gender, or fitness or music making or sociality. They depend upon your interest in that topic. There are, however, two very fine chapters that singularly, and more especially in combination, progress our understanding of the nature of the App. The first is called Is It Tuesday? (Morris 2018). This App is an intentional joke, as the only thing it does is answer the question of whether today is Tuesday and how often it has been asked that question. As such it reveals the way we use humour and irony to address our perception of this new App culture, best summarised by the phrase ‘There is an App for that’. This perspective highlights the single function App. If, to the hammer, everything looks like a nail, to the App developer, everything looks like a problem that can be solved by an App. The chapter employs terms such as microfunctionality and solutionism. The other excellent contribution addresses what may be regarded, in some ways, as the most successful App ever invented, the Chinese WeChat (Brunton 2018), in that WeChat does more and is more completely integrated into the lives of its users than any App used outside of China. The chapter shows why the very fact that it started out as a messenger App based around texting, in particular, is one of the reasons that it was able to develop this extraordinary form of incremental functionality that lies behind this success. On the basis of its underlying infrastructure the platform could then be turned into anything from a way to pay for goods, to the means to obtain an appointment with your doctor, and a host of other functions. The real contribution of this volume is that includes both these chapters, which are more or less the exact opposite of it each other. Most of my theoretical writings are inspired by the philosopher Hegel, whose concept of the dialectic became the foundation for my understanding of the term modernity. A key feature is the simultaneous and connected rise of ever greater particularity and ever more encompassing universality. In the introduction to the book Digital Anthropology that I wrote with Heather Horst we argued that the digital world is a major step forward in this trajectory, since it creates a vast set of new particularities on the basis of them all being reducible to code. In a rather different manner, something that we might call ‘scalable functionality’, is evident as the link between advanced in both particularity and universality as explored through the analysis of these two Apps. The approach of our project is very different, based on the holism of ethnography. 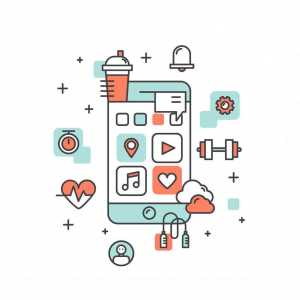 We tend to see Apps always in the context of all the other Apps it is associated with on a smartphone, and the smartphone in the context of everything else that its user is and does. But having a better sense of issues such as scalable functionality is certainly helpful in this task. Brunton, F. (2018) ‘WeChat; Messaging Apps and New Social Currency Transaction Tools’. pp 179-187, in Morris , J and Murray S. Eds. 2018 Appified. Ann Arbor: University of Michigan Press. Morris. J. (2018) ‘Is it Tuesday: Novelty Apps and Digital Solutionism’. pp 91-99. in Morris , J and Murray S. Eds. 2018 Appified. Ann Arbor: University of Michigan Press.